Meet us at Story on the Square from 11:00 am - 12:00 pm to discuss Roshani Chokshi, debut novel Aru Shah and the End of Time. This is Percy Jackson meets Sailor Moon in the inaugural title in the Rick Riordan Presents program, a wild-and wildly funny-epic journey based on Hindu mythology. This is a terrific new series from the the creator of the Percy Jackson books that covers mythology and folklore from India this time. There is so much to learn, but it is so fun to go along the adventure with 12 year old Aru Shah. The lovely author is a native of Henry County, and her dad is a local physician at Piedmont Henry, Dr. Chokshi. 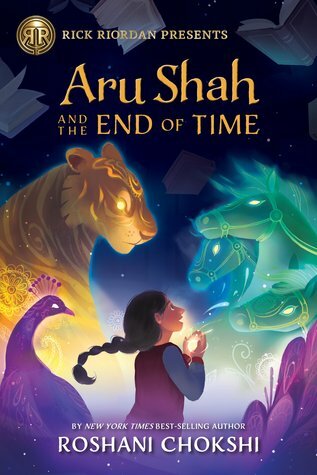 Roshani Chokshi is an established YA author, having written The Star-Touched Queen and A Crown of Wishes, but this book is firmly a middle reader gem, perfect for those smart 6-12 year old readers.